Sechser, Todd S. and Matthew Fuhrmann. 2017. Nuclear Weapons and Coercive Diplomacy. Cambridge: Cambridge University Press. Stulberg, Adam N. and Matthew Fuhrmann, eds. 2013. 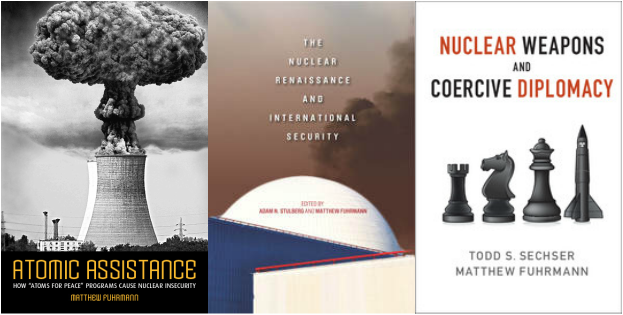 The Nuclear Renaissance and International Security. Palo Alto, CA: Stanford University Press. Fuhrmann, Matthew. 2012. Atomic Assistance: How 'Atoms for Peace' Programs Cause Nuclear Insecurity. Ithaca, NY: Cornell University Press (Studies in Security Affairs). Horowitz, Michael C., Sarah E. Kreps, and Matthew Fuhrmann. 2016. "Separating Fact from Fiction in the Debate Over Drone Proliferation." International Security 41 (2): 7-42. Fuhrmann, Matthew and Yonatan Lupu. 2016. "Do Arms Control Treaties Work? Assessing the Effectiveness of the Nuclear Nonproliferation Treaty." International Studies Quarterly 60 (3): 530-539. Fuhrmann, Matthew and Benjamin Tkach. 2015. "Almost Nuclear: Introducing the Nuclear Latency Dataset." Conflict Management and Peace Science 32 (4): 443-461. Replication files. Fuhrmann, Matthew and Michael C. Horowitz. 2015. "When Leaders Matter: Rebel Experience and Nuclear Proliferation." Journal of Politics 77 (1): 72-87. Replication files. PDF. Fuhrmann, Matthew and Todd S. Sechser. 2014. "Signaling Alliance Commitments: Hand-Tying and Sunk Costs in Extended Nuclear Deterrence. American Journal of Political Science 58 (4): 919-935. Replication files. Supplementary appendix. Fuhrmann, Matthew and Todd S. Sechser. 2014. "Nuclear Strategy, Nonproliferation, and the Causes of Foreign Nuclear Deployments," Journal of Conflict Resolution 58 (2): 455-480. Replication files. Sechser, Todd S. and Matthew Fuhrmann. 2013. "Crisis Bargaining and Nuclear Blackmail." International Organization 67 (1): 173-195. Replication files. Supplementary appendix. Early, Bryan R., Matthew Fuhrmann, and Quan Li. 2013. "Atoms for Terror? Nuclear Programs and Noncatastrophic Nuclear and Radiological Terrorism," British Journal of Political Science 43 (4): 915-936. Replication files. Fuhrmann, Matthew. 2012. “Splitting Atoms: Why Do Countries Build Nuclear Power Plants?” International Interactions 38 (1): 29-57. Replication files. Fuhrmann, Matthew and Jeffrey Berejikian. 2012. “Disaggregating Noncompliance: Abstention versus Predation in the Nuclear Nonproliferation Treaty,” Journal of Conflict Resolution 56 (3): 355-381. Replication files. Li, Quan, Matthew Fuhrmann, Bryan R. Early, and Arnold Vedlitz. 2012. “Preferences, Knowledge, and Citizen Probability Assessments of the Terrorism Risk of Nuclear Power,” Review of Policy Research 29 (2): 207-227. Kreps, Sarah E. and Matthew Fuhrmann. 2011. “Attacking the Atom: Does Bombing Nuclear Facilities Affect Proliferation?” Journal of Strategic Studies 34 (2): 161-187. Fuhrmann, Matthew and Sarah E. Kreps. 2010. “Targeting Nuclear Programs in War and Peace: A Quantitative Empirical Analysis, 1941-2000,” Journal of Conflict Resolution 54 (6): 831-859. Replication files. Supplementary appendix. Fuhrmann, Matthew. 2009. “Spreading Temptation: Proliferation and Peaceful Nuclear Cooperation Agreements,” International Security 34 (1): 7-41. Fuhrmann, Matthew and Jaroslav Tir. 2009. “Territorial Dimensions of Enduring Internal Rivalries,” Conflict Management and Peace Science 26 (4): 307-329. Replication files. Fuhrmann, Matthew. 2009. “Taking a Walk on the Supply Side: The Determinants of Civilian Nuclear Cooperation,” Journal of Conflict Resolution 53 (2): 181-208. Replication files. Supplementary appendix. Fuhrmann, Matthew. 2008. “Exporting Mass Destruction? The Determinants of Dual-Use Trade,” Journal of Peace Research 45 (5): 633-652. Replication files. Fuhrmann, Matthew and Bryan R. Early. 2008. “Following START: Risk Acceptance and the 1991-92 Presidential Nuclear Initiatives,” Foreign Policy Analysis 4 (1): 21-43.